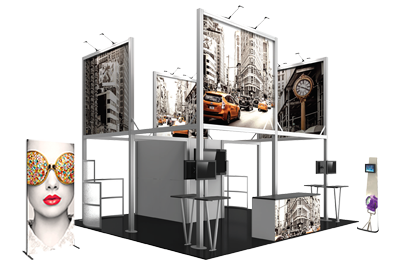 The Embrace™ 12.5ft (5 Quad x 3 Quad) backlit push-fit fabric display is a sleek illuminated collapsible display. The Backlit Embrace makes it simple to make a big impact in minutes with easy-to-attach patent-pending LED lighting and a push-fit backlit graphic that attaches to channel bars around the perimeter of the frame. 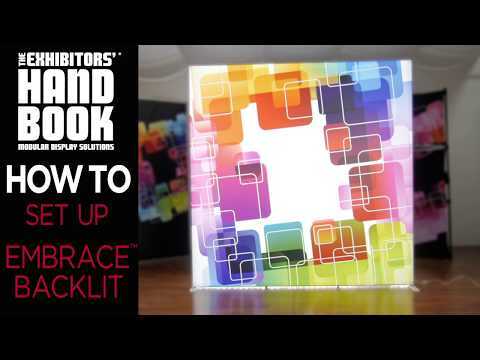 Simply attach lights to the collapsible frame and insert the graphic into the channel bars for an impactful illuminated display solution! Graphics available as single or double-sided with endcaps. No tools are required for assembly. A protective molded case for storage and transport are included. Option available to purchase frame, LED lights and case only.